Have you heard of Occam’s Razor? No, it’s not for shaving. Even if you haven’t heard of the principle, you’ve probably used it plenty of times in your life. Check out these Occam Razor facts and learn how it can help you simplify your life and even avoid stress. Occam’s razor is a philosophical principle that states, “Entities should not be multiplied unnecessarily.” In simpler terms, the principle says that the simplest explanation is most likely the correct one. There is a plethora of examples that can be used to further explain the principle. Here are a few. You’re sitting in your living room and hear a loud noise coming from above. Should you assume that a.) A low-flying airplane is flying overhead or b.) A spaceship is right above your roof and about to abduct you. While both can be considered possible conclusions, “a” is a more likely explanation. You get a notice saying that you over drafted your bank account. Should you assume that a.) Your account was hacked and someone stole your money in an attempt to teach you a lesson about thriftiness or b.) You miscalculated your payments and spent more than you had. Bank account hacking is a possibility these days but more than likely the error was on your part, making “b” the best answer. Your doorbell rings and it’s the local mail service with a package. Should you assume that a.) Your mom must have sent you a gift because your birthday is next week or b.) An ex-lover has finally decided to seek revenge and sent a dangerous package to your doorstep. No matter how bad your past relationships ended, “a” is the more likely answer between the two. Can you see how many of us use the principle in our everyday lives, even without realizing it? The origins of Occam’s Razor are a bit hazy. While William of Ockham is credited with the principle, he wasn’t exactly the first to put the idea in writing or to speak of it. Instead, he is more credited with making the principle well known. 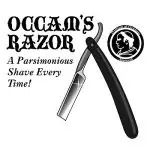 One of the more surprising Occam’s Razor facts is that the phrase has never been found in any of William of Ockham’s writings. Regardless, he has been forever linked to this philosophy which has long been a common thread between ancient and current philosophers. Occam’s Razor can be used plenty of ways by children, adults and professionals. You can use Occam’s Razor from the moment you wake up all the way until you go to sleep. From trying to figure out where your keys are to trying to determine why there’s more traffic than usual or wondering why your favorite television program isn’t on at night, you can use the theory to help answer the countless questions that run through your head throughout the day. Occam’s Razor can also eliminate stress in your life. When you spend too much time wondering and worrying about certain situations, you add unnecessary strain to your day. By focusing on the most probable answer, you can stop worrying about things that will most likely never come to be. It can be speculated that utilizing Occam’s Razor can have a positive effect on your overall quality of life and health. Many specialized industries use Occam’s Razor to complete their work. The most obvious and beneficial is the medical industry. Doctors and nurses use Occam’s Razor to help diagnose patients. For example, if a patient presents themselves with symptoms that include a fever and chills, Occam’s Razor would suggest that the patient has an infection that the body is trying to fight off. It is less likely that the patient has a rare illness only found in a country halfway across the world. Using Occam’s Razor in the medical field helps doctors save time and heal patients more efficiently and effectively. Occam’s Razor shouldn’t be mistaken for a perfect philosophy. There are times when relying on it can lead to less than ideal results. While in the majority of situations and the majority of the time, the simplest answer is the right answer. But when the less than likely answer is actually the right one, issues can arise. For example, a doctor who misdiagnoses a patient because they didn’t consider any not so common illnesses can put the life of their patient in jeopardy. This is why it’s important to use Occam’s Razor with an open mind. While it can help you solve an issue or come to a conclusion that is more than likely correct, you should always remember that there are other possibilities. If you find yourself resorting to crazy solutions or reasoning for life’s problems, consider adapting the philosophy of Occam’s Razor. You’re sure to find that the majority of situations are not nearly as dire as your brain is making them out to be.